Since breaking out as a star in the early years of this century, Colin Farrell has established himself as Hollywood's "beautiful people." He's ranked on lists in gossip magazines and earned the hearts of many teenage girls (having an Irish accent doesn't hurt either). 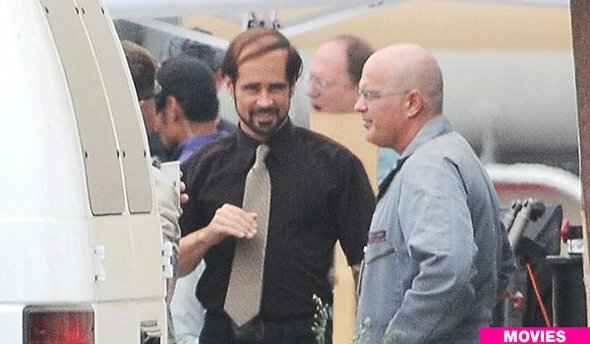 To say the least, things would likely be quite different if he looked as he does in the upcoming Horrible Bosses. The New York Post has gotten its mitts on a shot of Farrell on set and...yikes. Sporting a comb-over reminiscent of Woody Harrelson's character in the film Kingpin, never did I think a man this good looking could have his looks damaged so severely by a hair style. In the film, which has a plot similar to Alfred Hitchcock's Strangers on a Train, Farrell plays one of the title characters that has a target on his back when Charlie Day, Jason Bateman and Jason Sudeikis decide they can no longer take their horrible professional lives. Jennifer Aniston and Kevin Spacey will round out the rest of cast on the bosses side. Check out the image below.